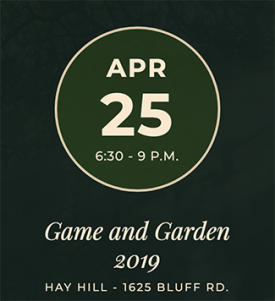 The Congaree Land Trust announces its fourth annual Game and Garden: Spring Feast “friend-raiser” event to be held on Thursday, April 25 from 6:30 p.m. to 9:00 p.m. at Hay Hill Events. This ticketed event is open to the public, and supports land conservation efforts across Central South Carolina with an evening of conversation, cocktails and cooking on the wild side. Game and Garden will feature local chefs cooking with South Carolina game, such as quail and squab, as well as local stone-ground grits, heirloom grains and seasonal produce. A silent auction is provided by Over the Mantle Gallery, featuring original artwork by local artists to bid on. Performing live is award-winning bluegrass band, Palmetto Blue. Bar offerings include local craft beer, wine and a hand-crafted cocktail by Joshua Streetman of Motor Supply Co. Bistro. Now in its fourth year, Game and Garden is a casual evening of food and fun dedicated to preserving lands of scenic and working value in the area. This year’s event marks the final event to be held at the charming and rustic Hay Hill venue. Join CLT in aiding their mission to preserve the natural heritage of central South Carolina at Game and Garden: Spring Feast. A General Admission ticket (individual or couples) includes a one-year membership to Congaree Land Trust.